When you’ve had a slice of your favorite cheesecake, don’t you just want to have another? 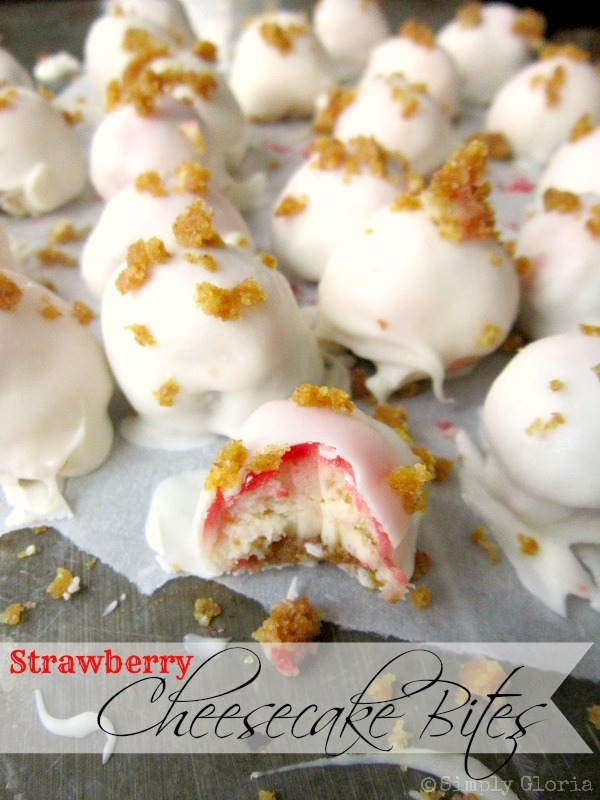 These little Strawberry Cheesecake Bites are just the perfect size! And having them dipped in white chocolate is even an extra treat! The only ingredients you need for this recipe is your favorite cheesecake and 8 ounces of white chocolate. 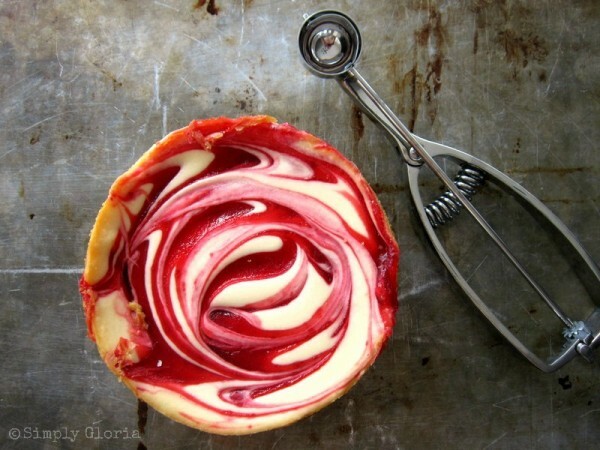 You can make your own cheesecake from scratch…which I love to do! But, today I needed my cheesecake fix right away! Use a small cookie scoop. And start scooping out the cheesecake– with the graham cracker crust, of course! Save a few of the crumbles for later…about 2 tablespoons. 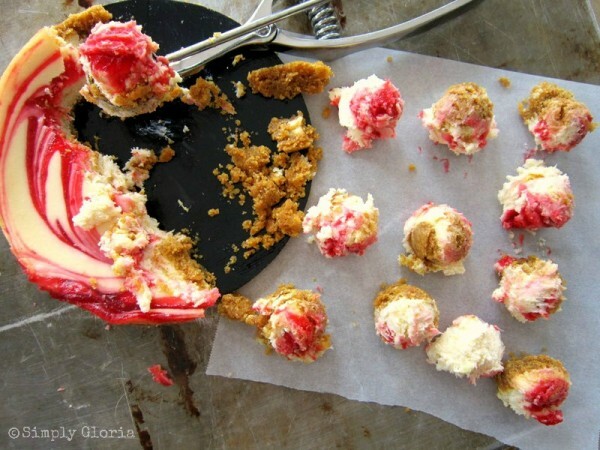 Take the cheesecake scoops out of freezer and start forming into smooth round balls between your palms. The heat of your hands will warm the cheesecake up a bit. So you may need to put back into freezer if they are too soft. Dip your fork into the melted white chocolate, then place a cheesecake scoop on top of the fork. Dip into the chocolate and shake off the excess chocolate. Put back onto the paper and immediately sprinkle the graham cracker crust on top. Repeat with all the others. *Note: because the cheesecake scoops are still cold from the freezer– your chocolate may need to be reheated a bit more with the pan of hot water, as you continue the process. These little delectable treats are ready to enjoy as soon as the chocolate is set up. (It sets up fast!) So, if you’re like me– I was already “testing” one when the 2nd one was being dipped! If you love these Strawberry Cheesecake Bites, then you are going to love these Fudge Brownie Cheesecake Bites! These are the perfect little treats to devour… one by one! Store in the refrigerator. 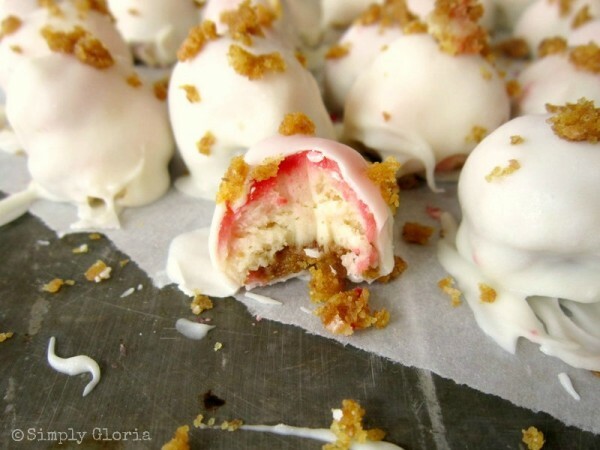 Makes about 2 dozen Cheesecake Bites to share! Use a small cookie scoop. Scoop into the cheesecake, with the crust. Save 2 tablespoons of crust. Place scoops onto parchment or wax paper. Place into freezer for 20 to 30 minutes. 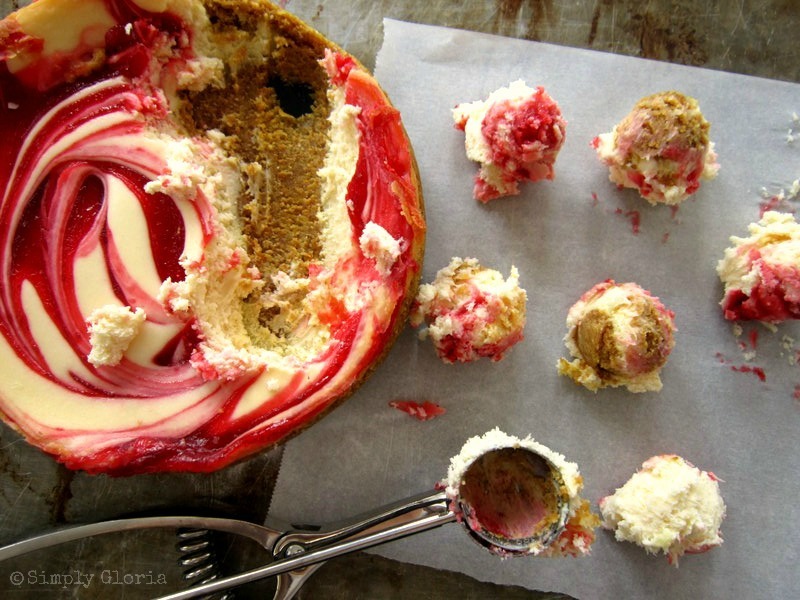 Take the scoops of cheesecake out of freezer and form into rolled balls. Place a scoop of cheesecake on top of the chocolate covered fork. Dip cheesecake and shake off excess of chocolate. Immediately sprinkle crumbled graham cracker crust on top of chocolate. Repeat process with the rest. I love love love the swirly strawberry colors on the white. And the graham crackers. MMmm! And the white chocolate. Gorgeous, Gloria! Yes please, I’ll take two! Great party food, thanks! 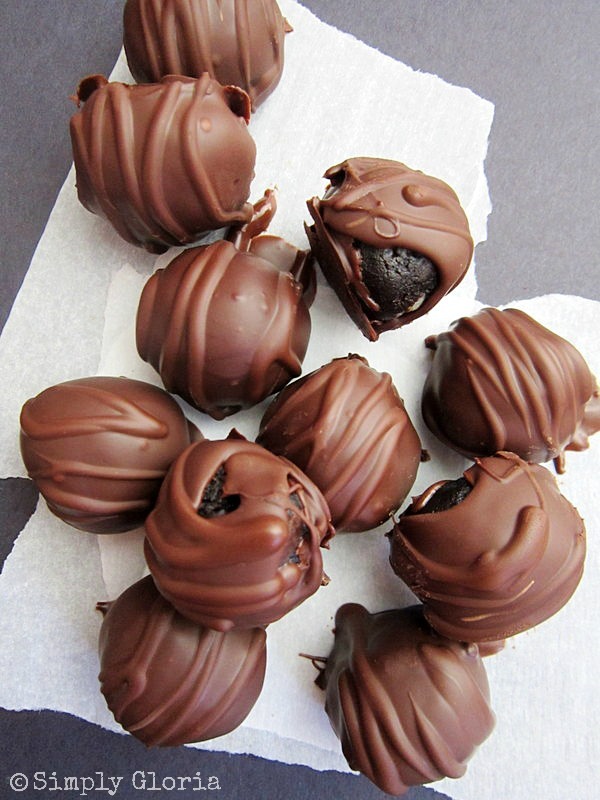 I used to make something similar but didn’t dip them in chocolate, yum. One bite, no guilt! Sugar et al recently posted…Mirrors for life. And Crepes with Caramelised Oranges and Spiced Orange Syrup. Sonali, thank you! They truly are little bites of heaven! These bites… gah! So pretty. I want to eat them all up. These little bites are very tempting to just gobble the whole plate! This is why I have to share them…or I’ll nibble on them one…by one! Thanks, Ashley! I love the idea of using a cheesecake that is already made! Genius! Visiting from Dream to Reality. It does saves so much time to use the already made cheesecakes! Thanks, Rita! Hope you’re having a fun Wednesday! Holy cheesecake girl! These look incredible! Pinning! Thanks for the PIN action, Trish! I’ll trade you some cheesecake bites for some of your awesome coleslaw! Um yes, I will take all of these! What a fantastic idea. I must try this soon! Clydia @ Three Mango Seeds recently posted…MY FIRST REUPHOLSTERING PROJECT & THE HGTV FABRIC LINE! These look fantastic!! Pinned 😉 Thanks so much for sharing!! Have a lovely weekend! This looks AMAZING! Thanks for linking it up at Monday Funday! What a great recipe to make if short on time! OR if you have tons of time to stuff your face- cuz that’s what I would end up doing!! LOVE LOVE LOVE! It’s definitely a stuff-your-face kind of dessert! Or we could always convince ourselves…just one more…lol! Gloria, I know your blog is titled “Simply Goria”, but it can also be titled “Simply GENIUS”!!!!!!! What a fantastic idea for portion control…….maybe! 🙂 And it’s also more fun than a regular cheesecake! It is a little different than the usual “have a slice of cheesecake” dessert…they’re perfect to bring to parties! And you’re so sweet, Amy…blog hugs! Hope you’re having a fun friday! Featuring these tomorrow! Thanks so much for linking up to ITS PARTY TIME via THREE MANGO SEEDS! Clydia @ Three Mango Seeds recently posted…HIRED! OUR FIRST CUSTOM REFINISHING JOB. Seriously Gloria… I soooo need to have some RIGHT NOW!! Yum! Thanks sooo much for partying with me! Can’t wait to see what you link up at The DIY Dreamer… From Dream To Reality tomorrow evening! Oh yum! 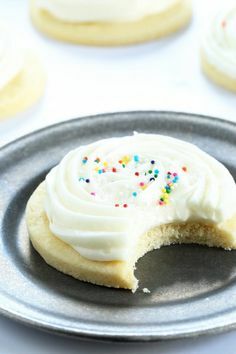 Lemon and white chocolate are my favorite! And that cheesecake of yours, Laura sounds divine! Do you have the recipe up on your site? I know what you mean…most of the time I seriously have to not announce that something is done baking because I wouldn’t be able to do the photos! You’re so sweet…. 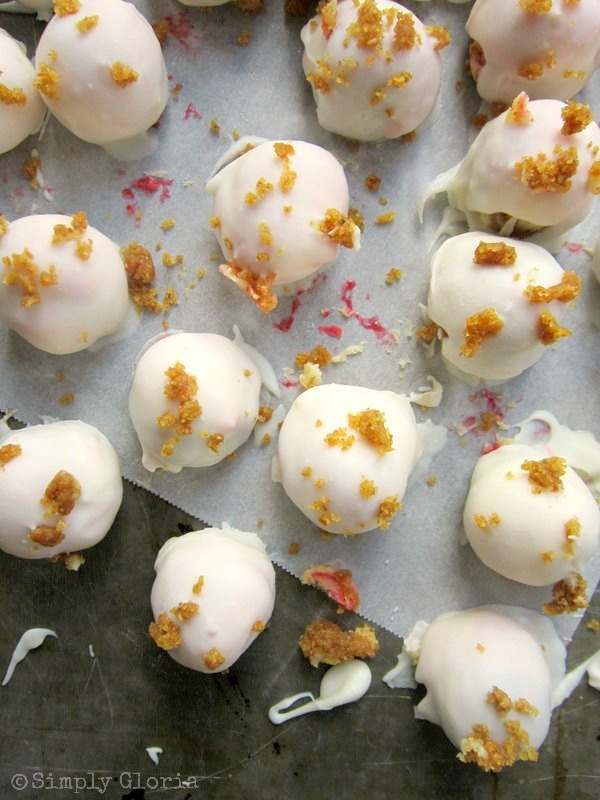 can’t wait to try the lemon cheesecake treats when you put them up! Wow what a fabulous idea! These look to die for 🙂 Thanks so much for sharing with us at Weekend Wonders! Hope you’re enjoying your week so far! Jessie recently posted…Etsy Shop Love w/ The Thriftiness Miss: Very Simple Design + A Giveaway! Thanks Jessie! Hope you’re having a fun Tuesday! These look absolutely sinful! Gosh, I want one now! Pinning! Also, Gloria, can you tell me how you make your recipe with the print button at the bottom of the post? I really would like to try that for my recipes. Thanks you! Thank you for the Pin action Karen! 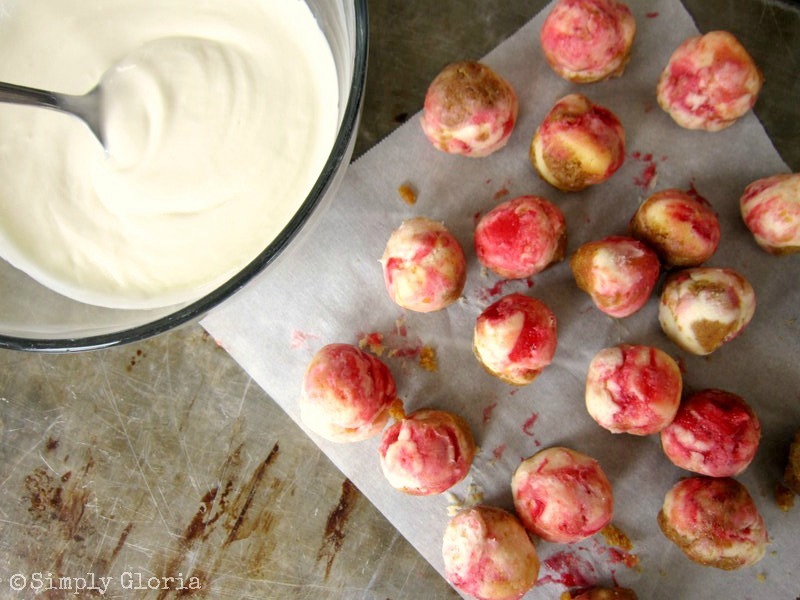 They’re the perfect treat to make this summer because there’s no oven use. These are beautiful! I can’t wait to try them soon. Thanks for sharing Gloria! Thanks for featuring my recipe! Have a great a weekend, Aubrey! These little bites of heaven are very easy and fast to make…and eat! Thanks Michelle! Love the hashtag statement! Thanks Chris! I ran across this little recipe and it is definitely ingenious for a quick fix on a cheesecake craving! Thank you! Jennifer recently posted…Cheesecake… Decadently Delicious! Thank you Jennifer!! It truly is one of those quick fixes for cheesecake craving! Ok I couldn’t find a cheesecake and don’t have time to make one from scratch. Could I just add cheesecake filling, strawberry topping and graham crackers in a bowl and mix th up?? That sounds good! I’d mix up the cheesecake filling and swirl it with the strawberry topping. Let it chill. Roll into balls. And chill again or put in freezer for a few minutes. Then roll them into the graham crackers. Put back into the fridge or freezer. Then dip into the white chocolate. Let me know how they turned out, Trey! Thanks for asking me this great question! Have a great day! Yay!! But just remember, the best thing about doing and making things homemade…are not always perfect. And that is why homemade is the best! Trey have a great weekend coming up! If there should be any left should the cheesecake bites be refrigerated? Gloria recently posted…Snap It or Bake It Giveaway! Ummm- ok I feel stupid. What do you mean “dip fork in chocolate/place cheesecake on top of choc covered fork???? I’ve made a lot of baked cheesecakes…and this one is the most successful one. The recipe is easy to follow as well. It says double decker, but I just make the filling and put it all in a spring form pan over the crust. You’ll be amazed how easy it really is to make cheesecake at home! Thank you Jackie! Hope you have a great weekend coming up! Any idea on the life of these please. Look gorgeous! They look fantastic! Have you tried freezing them? How did they turn out? Thanks! Where did you get the prepared cheesecake from? This recipe is killing me! Just want to know if I can make this using a No BAKE cheesecake? or will it only work with a baked one? The furniture sofa can be transformed into a bed during night time or when necessities arise. This is especially important with imported pieces of furniture. am and ends on May 25, 2012 at 11:59 pm. What a smart idea! Love them! I will put it up on my Cheesecake (Ostekake) facebook page! Julie Henriksen recently posted…Hamburgerpresse Fra Sagaform – Imponer med Hjemmelaget Hamburger! It’s very good to read this useful post on dog training. I have a concern however. How do you work with a younger dog? These look amazing! Do you think I can make ahead and keep in the freezer after the chocolate has set? Kate, the freezer may crack the white chocolate. Storing in the refrigerator would be best. Hope you enjoy them!